Pipe 73% Brownie batter into tartlets. Bake at 320ºF/160ºC for 10- 15 minutes or until completely set. Pipe into Silikomart Mini Truffle molds (S.O.S 36.172.87.0065) the Cherry Mousse, press in a cherry and scrape off the excess mousse. 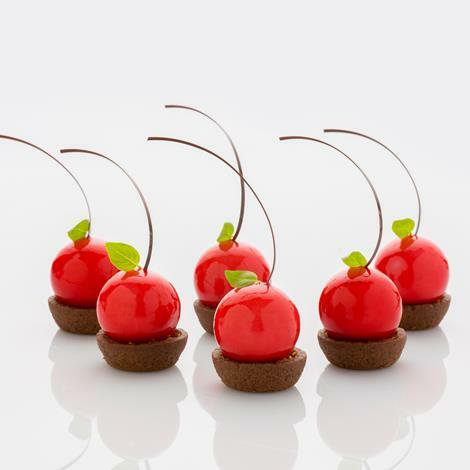 Using a toothpick, dip the um-molded Cherry Mousse into the Cherry Mirror Glaze place directly onto the brownies tartlets; then remove the toothpick. Garnish with desired chocolate décor for stems; add a micro leaf as well. In a stand mixer fitted with a whip attachment, combine the sugars and salt with the yolks whip on medium speed until full volume. In a separate bowl, combine the melted the butter with the chocolate. In a second stand mixer fitted with a whip attachment, whip the egg whites to stiff peaks. Fold the melted chocolate mixture into the yolks, fold in the sifted flour then the egg whites. Spread evenly on a half sheet pan and bake at 320ºF/160ºC for 10-15 minutes or until completely set. Whisk together the alaska mousse mix and the water incorporate the cherry paste. Fold the whipped cream into the mixture in two stages. In a sauce pan combine the powders and water; bring to a rolling boil for 3-5 minutes. Stir in the cherry puree and lemon juice.